The 2011 NFL season promises to be as explosive as usual & the competition is always unpredictable & it is very true that on 'Any given Sunday' any team can win against any other team. The excellent draft system & league salary cap ensure that there is a level of parity between teams that could only be dreamt of in the professional sports leagues of Europe - for a franchise to build a dynasty & win more than 2 championships in a short space of time is an incredible achievement as the level of competition in every single season is intense. This year there is an added level of intrigue due to the 4 month long lockout caused by the labour dispute between players & owners. There is a theory that this will benefit the established teams with a tight unit of players as they will be able to get back into the groove running & completing plays successfully more than teams going through a period of change. This certainly explains the powerhouse that are the New England Patriots & last years impressive, in defense & offense, Super Bowl winners Green Bay Packers sitting at the top of the betting market. We'll look at the leading fancies from the AFC below with the NFC contenders to follow shortly. The AFC side of the league looks to have slightly more strength in depth than the NFC this season with several franchises appearing credible challengers for the Super Bowl, they will be looking to change their fortunes after largely dominating for a decade before NFC sides won 3 of the last 4 championships. New England Patriots are simply one of, if not, the best run sides in all of football winning the AFC East division in 8 of the last 10 years & 3 Super Bowls along the way (2001, 03 & 04). They are led by meticulous coach Bill Bellichick & 'Mr Perfect' quarterback Tom Brady who managed to throw 36 touchdowns & just 4 interceptions last year. In the regular season they managed 14 wins to 2 defeats before slipping up to divisional rivals the Jets in the playoffs. The offense has bolstered by the signing of Chad Ochocinco as an extra wide receiver, he may now be 33 but he managed 67 receptions last year & as Brady doesn't tend to target one individual too much (although he has a penchant for hitting the tight ends) he should be seen to good effect. On defense the Patriots have been solid for some time but they could become spectacular if the signing of the disruptive & destructive nose tackle Albert Haynesworth pays off. Haynesworth is a monster at the line & was voted defensive player of the year in 2008, after signing on an incredible $100m+ deal for Washington Redskins last year everything went wrong with Haynesworth taking exception to being played out of position & eventually being suspended by the team - if New England can get him in shape & back to something like his best he will get plenty of sacks & hits on quarterbacks this season. Quite simply the New England Patriots are deserving of their place at the top of the market and best odds of 13/2 with SportingBet seem fair. The Pittsburgh Steelers are the winningest side in football with 6 Super Bowls & were last year's runners up to the Packers & as another well run organisation have a good chance of being able to deal with the limited pre season better than most sides. They say that defenses win championships & Pittsburgh have always subscribed to this theory, their current side has the stand out defensve players Troy Polamalu & hard hitting James Harrison backed up by a rock solid core including Ziggy Hood, Lawrence Timmons & Brett Keisel. Corner back still seems to be a weak area (as seen in William Gay's terrible performance in the Super Bowl) & although no team appears to be able to run the ball against the Steelers (conceded less than 63 rushing yards per game in 2010), elite quarterbacks can exploit this weakness with big throws over the top. In offense the Steelers are regularly underestimated with many still not believing 'Big Ben' Roethelisberger is an elite QB even though he's led them to 2 titles (1st as a 2nd season rookie) & another Super Bowl. Roetheliberger appears to be the main man in clutch situations, bringing home game winning drives with unerring consistency, the main problem is that the players in front of him don't seem to be able to stop him being hit. The offensive line has been a problem for some time & hasn't really been upgraded, it is key for them to keep last year's1st round draft pick Maurkice Pouncey fit at centre otherwise they will continue to prove vulnerable & if Ben keeps getting hit he will get injured. In terms of point scoring talent Rashard Mendenhall needs to continue improving & get a 3rd consecutive 1000+ yard rushing season, the Steelers are excellent once they establish the run which sets Roethelisberger up to pass to speedball Mike Wallace. The receiver core has been boosted by the signing of Jericho Crotchery who should add depth, last year's decent rookie Emmanuel Sanders can improve to be more involved in games & 35 year old veteran Heinz Ward will continue to do his thing as speed has never been the main facet of his game. The Steelers are tough, tough, tough & are likely to be there abouts, however without any immediately obvious improvements to the O-Line Big Ben may take too much of a battering & best odds of 15/1 with Bet365 are fair but untempting. The San Diego Chargers are currently 4th in the betting for the Super Bowl & it's not hard to see why as they are red hot favourites to win the AFC West division & make it to the playoffs, they have a high powered offense & a defense that can shut teams down. In 2010 they had the number 1 ranked offense & defense yet only finished 9-7 & missed out on the playoffs, that was because football isn't just a game of offense & defense but a third discipline that the Chargers are the worst at by a country mile - Special Teams! Last year they were dreadful with blocked punts, fumbled returns & allowing teams to run back kickoffs & punt returns with alarming regularity. If the special teams mistakes can be cut out then an offense containing QB Philip Rivers, who regularly puts up big numbers, 7 time pro bowler Antonio Gates at tight end & elite wide receiver Vincent Jackson can combine for some high scoring. The offensive line is strong & they are decent without being spectacular at running back & the defense is good (the number 1 ranking is flattering - due to giving away so many big plays on special teams & turnovers the defense was on the field less than other teams giving them less opportunity to concede yards), this could well be their year but they aren't our pick at 12/1 with Bwin as they need to run the ball a little better otherwise they will become too predictable & sides will go all out for the sacks on Rivers. However the rest of their division are weak fare & the 8/15 for San Diego to win the AFC West should be taken as it is a simple enough task. 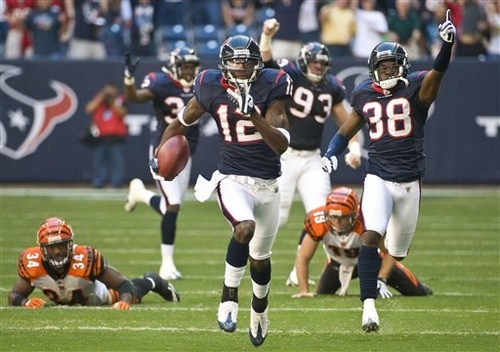 The 2011 season will be the Houston Texans 10th in the NFL & after finishing 2009 with the franchise's first winning season before slipping up last year they will be hoping to improve massively this year with a run at the Super Bowl. The Texans have one of the most exciting offenses in the game with quarterback Matt Schaub having thrown for over 4,000 yards in the last 2 seasons & having an impressive career rating of 91.5, top wide out Andre Johnson & most importantly the superstar running back in Arian Foster. Foster was the league's leading rusher with over 100 yards a game plus was excellent out of the back field with 66 receptions & 604 receiving yards - if Foster & his compatriots on offense can keep things going they will be one of the most dangerous teams in the league. Unfortunately for the Texans their defense has not kept up their side of the bargain in recent seasons, last season they gave up the most yards through the air of any side although weren't so bad against the run (maybe teams didn't try running as it was so easy to pass!). However the management have recognised their weakness & brought in former Cowboys head coach as the defensive coach who has gone about changing the defensive scheme from a 4-3 to a disruptive 3-4 formation. The change should allow them to get more pressure on the opposing quarterback & lead to fewer big plays against them. They've upgraded at corner back too, bringing in Johnathan Joseph from Cincinnati who should give them more chance of interceptions & negating the deep threat. Houston will lose games but if they can get to the playoffs they have the ability to beat any team in the league, therefore the key to their chance is in reaching the playoffs & this season offers a great opportunity as divisional rivals the Indianapolis Colts seem to have reached a plateau & their ace QB Peyton Manning has had surgery in the offseason & may even miss play & will almost certainly start slowly - the Texans can get a headstart with a win against the Colts on the opening weekend. At best odds of 25/1 with Victor Chandler (as low as 16/1 with many) they are our outright pick for the win, with Boylesports they are an excellent 27/20 to win the AFC South division.